Following up with our 2012 work with with the Los Angeles Business Council, the premier business advocacy organization in Los Angeles County, Urban One co-authored the 2013 Livable Communities Report: A Call to Action with Paul Habibi of UCLA Anderson School of Management and Grayslake Advisors. 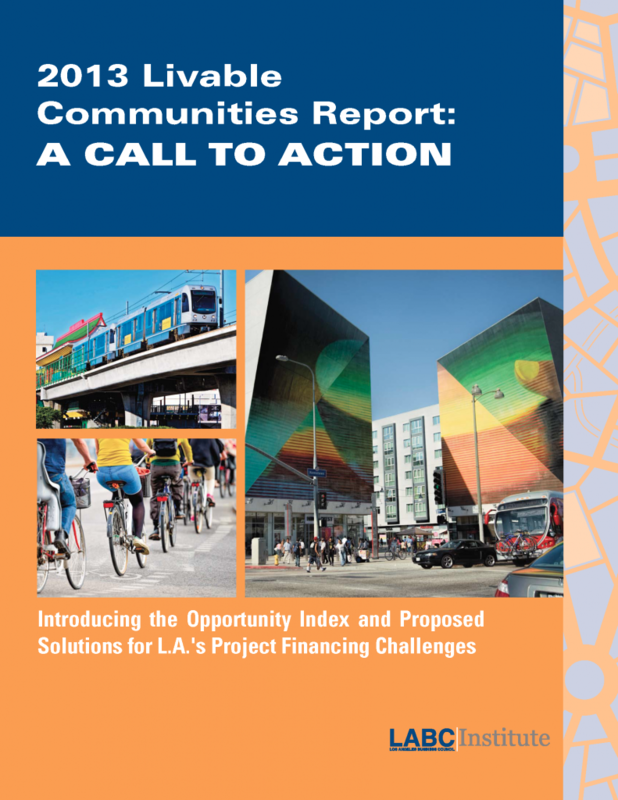 The 2013 Report expands upon the concepts of livability and Transit Corridor Development that were introduced in 2012, and proposes practical recommendations for policymakers to increase development of livable communities, specifically for workforce housing that is affordable to Los Angeles residents earning 50% to 120% of the Area Median Income. The Report also introduces the Livable Community Opportunity Index – a composite index designed to enable public agencies and private developers to rate the market potential for transit station areas to support livable community development. The index looks at population, housing, employment, transit ridership, income, and land values to give practitioners a birds-eye view of neighborhoods and seek out and analyze opportunity sites to develop projects that are integrated into the Los Angeles region’s rapidly growing transit network. Urban One seeks out opportunities for livable community development in our own projects, whether they are residential, commercial, or transportation opportunities. One of our core values for development is to create smart projects that connect with their surrounding context, and in Los Angeles, this increasingly means looking at creative ways to connect to transit assets. Urban One strives to pursue the recommendations contained within the 2013 Livable Communities Report, and we are excited about the traction the report has gained in local media and policy circles. Conceptual rendering by Gensler of potential livable mixed-use development at the Florence/La Brea Station of the future Crenshaw Line in Inglewood.